I told Leah I wanted to go on a tour of the countryside. Well, we found precisely what we were looking for. Downtown Siem Reap has a tour company called “Beyond: Unique Escapes” www.beyonduniqueescapes.com They offer many unique tours (as their name suggests). Including the “A Day in the Life” tour which was exactly what I wanted to do. So we booked it. 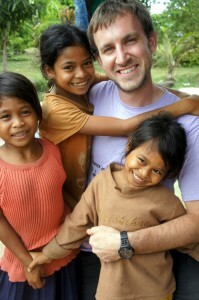 A high percentage of the tour cost went back into the community to build schools, homes, and water wells. It’s part of a “Responsible Tourism Initiative.” The initiative’s goal is to ensure tourism directly benefits local Cambodian families. So we booked the tour and waited. I have to admit, I was so excited, like a little kid awaiting Christmas. It was hard to sleep the night before; the tour guide couldn’t arrive soon enough. At 8 am a car pulled up to our hostel. What?!? a car? we hadn’t been in a car in… weeks. Our Cambodian guide “Kim” came out and greeted us in impeccable english. (I silently rejoiced at his english skills, guides can be hit or miss) We got in the back of the car and headed down the red dirt roads out-of-town. The guide explained the tour company’s operations and how he liked working for the company. 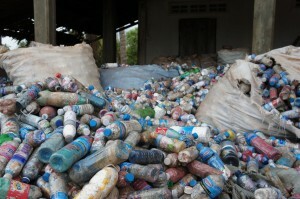 It is a joint venture between a Cambodian family and an Australian family. They have made a big impact in the village we were going to visit. 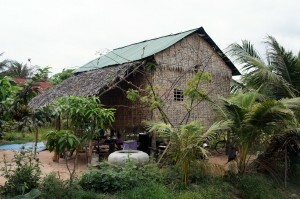 Within 5 minutes, we were out of the tourist hive of Siem Reap and into the countryside. People waved at us as we drove down nearly vacant dirt roads. We never saw a car, and rarely passed scooters. People stopped what they were doing and looked at us, then smiled and waved. Rice fields and houses on stilts were in every direction as far as we could see. We were awe-struck by the natural beauty of the countryside. The dirt roads were not maintained well so are car creeped along. It bottomed out many times on some of the biggest humps. After another 15 minutes we arrived at an ox cart. What?!? 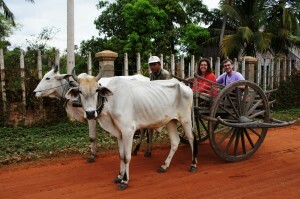 We were switching from the car to a cart driven by an elderly man and powered by oxen. YES! The wooden wheels seemed to magnify every bump in the road. It was bumpy, it was slow, and it was a bit smelly at times: But we loved it! 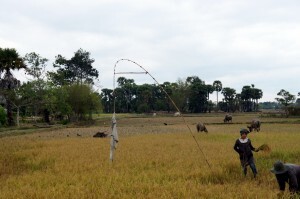 The cart meandered us on a dirt path between rice fields. The axles squeaked as the huge wooden wheels turned. People in fields waved to us and we waved back. Our tour guide met us about 15 minutes later. We dismounted the ox cart and began our walk through the fields. We were met by a friendly man threshing rice. 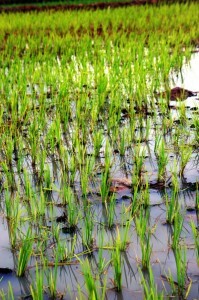 With the goal of removing the rice grain from the stalks, he walked oxen over rice the whole day. The stalks are then dried and used for oxen feed. The rice will be husked and sold at the market. He looks a little intense in the photo, but he had a huge smile when we waved to him as him and the tour guide chatted. We walked another 50 feet and saw a group of ladies. They were planting rice and giggling, smiling, laughing, and chatting the whole time. Pretty much what happens whenever you get a group of ladies together. It must be universal. 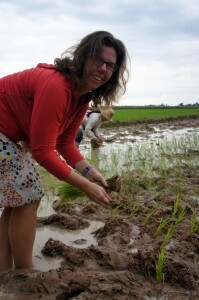 We wanted to give rice planting a try and the ladies were more than excited to give us a shot. 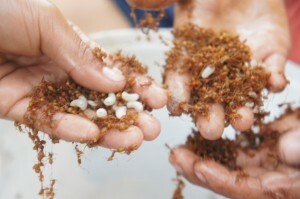 They quickly handed us a bunch of seedling rice plants and showed us their technique. Before we knew it, we were barefoot in a half foot of “mud” in the rice field. Mud oozed between our toes as we stepped through the soupy mixture. Here is the finished product. Next we walked to a golden rice of rice. 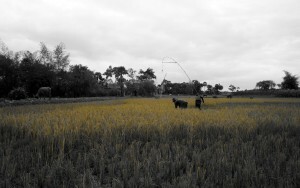 Ladies cut the rice stalks with sickles. 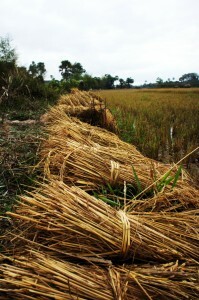 They busheled the rice stalks up to be threshed. Our path lead us to a water pump supplied by tours just like ours. 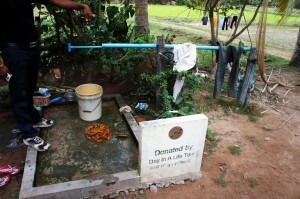 The pump provided clean drinking water to a family. Before the pump was installed, the family was drinking water from a nearby pond, which made them frequently ill. The water pump’s well was deep enough to reach the clean groundwater. A filter installed in the pump provided extra protection. The sun was high in the sky and our bellies were starting to rumble so we knew it was lunch time. The morning pasted in an instant. Our guide brought us to the host family. The tour company rotates which family the tour groups stay with. However, due to the low demand for this tour, the family we were staying with will only have 1-2 visitors per year. The single room house the host family lived in was funded by tours like ours. It cost $500 to build. 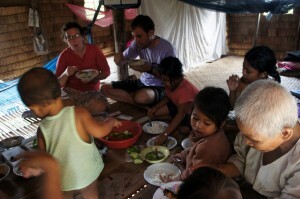 Before the tour built a home for the family, they all lived in a tent near the rice field. Inside the house lived 4 adorable girls, a cute little baby boy, and their parents. The mother of 5 was Leah’s age and the father worked as a fisherman. Our guide translated for us while the mother talked about her family. She said she was fortunate to have such a big family, everyone in good health and a nice husband. She also said he wasn’t violent and this was an extra blessing. Before we made lunch, we helped the family make siding for their home. 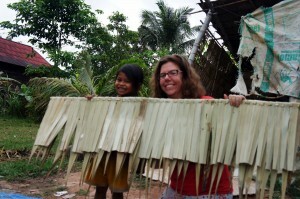 The siding was made from bamboo and leaves. We used a needle (made from part of a tin can) to weave the bamboo sticks through the leaves. 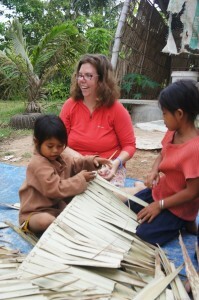 We had a lot of fun weaving with the children. They loved to help. 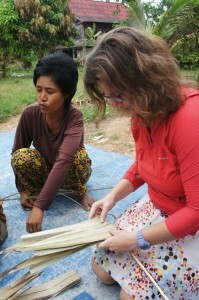 Here is the mother teaching Leah how to weave. After 5 minutes, the eager little beastie took over from Leah. Once complete, the siding will last 1 year, then they will need to make more siding and roofing for the home. Now it was time for lunch! Leah went to the market with the mother. Part of the cost of our tour paid for the meal we would share with the family. The children got suckers from the market, a much appreciated treat. While Leah was shopping, I was having an unbelievable time. This really happened. Haha, and I had to keep reminding myself that I wasn’t watching a tv show, or having a bizarre dream. The guide, the girls, and I caught our lunch. We grabbed a 10 foot long pole with a sickle attached to the end. Then the little beasties scurried around searching in the trees for… Fire Ant Nests! Hoots and hollers would let us know they found one, then we’d cut the nest from the tree (angering all the ants). The girls would run on to the nest (barefoot), now alive with angry fire ants, and pick it up! Laughing and screaming, they’d run over to a bucket of water and push the nest into the bucket. The ants would drown in the water. The girls and I swatted away fire ants from our skin and searched for a new nest. We caught maybe 6 or 7 nests this way. Each time the nest fell, the girls picked it up, the girls screamed, the ants got dunked. The kids loved it! and then the grandmother joined in. It was quite the affair. Here is a video, I tried to narrate it at the time, but I had a hard time keeping my laughter in. At the end you can see one girl with a HANDFULL of fire ants she just picked up and threw into the water. Crazy. After each nest the kids would go through all the ants and look for larvae. The larvae are the cream de la cream in the ant eating world. Being the guest, the children always gave me a beloved larvae before indulging themselves. So I ate a lot of ant larvae. You really HAVE to eat the larvae, what option do you have at this point? The children were so excited to give me the larvae they would have cried if I said no. So I popped them in my mouth, one after another. The larvae actually were pretty good, so it wasn’t difficult to eat so much of it. It had the texture of a mini grape. When you crushed it between your teeth a burst of milky, salty goodness came out. We were supposed to help make lunch. We tried, but the children really wanted to play. I think playing with them and keeping them out of their mom’s way probably was the biggest help we could be. We had the time of our lives. We mostly chased each other, played catch with sticks and a little stuffed bear, and other typical children games. One thing the girls loved to do was pop little flowers on our faces. The girls would hold the flowers in their hands and when they pressed them against our foreheads they’d pop. Then the girls would laugh. Then they’d do it again. Then the girls would laugh. Repeat that 50 times and you are halfway through our play date. The feast! What a feast it was. We had soup with wintermelon and ants, a little steamed wintermelon, ant and fish paste curry, and lots and lots of rice. My favorite was the ant and fish paste curry. The dish was basically rice, fish paste, ants, hot peppers, and other spices wrapped in a banana leaf. The tour provided ham and cheese sandwiches incase we couldn’t stomach the food, but we loved it. We gave our sandwiches to the children and they went crazy. They were so happy. Bread is a rarity for the children. The guide said every day they eat fish paste and rice. Three times a day. We also had oranges and bananas. The whole family loved the oranges, which they rarely if ever get. The bananas, eeh they had a banana tree behind their house. Our host’s mother and a couple of neighborhood children joined us for the feast. 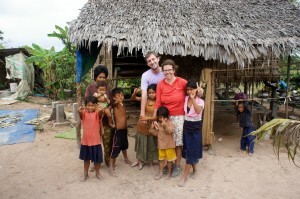 The host’s mother had lived through the Khmer Rouge days. She was extremely happy to live near all her grandchildren. She lived right next door. When we visited she was drying fish her son-in-law had caught. 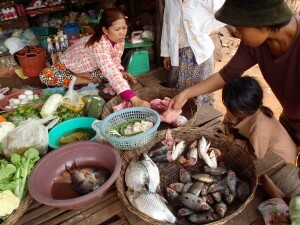 The fish will then be sold at the market. Her life was difficult during the Khmer Rouge reign. In the 3 years they had power, she lost 7 of her 10 children. 7! Some were taken as child soldiers and some died from easily curable diseases. Since the Khmer Rouge had closed all hospitals and detained all the educated class, there were no real doctors. The Khmer Rouge did appoint some doctors, basically whatever bozo had pull with the government. What good is an uneducated and unskilled doctor? And even if the doctor knew what antibiotics were, there were no medications to give or sell to the sick. So they died. After talking with the grandmother, we talked with the mother (through our guide) during dinner. She said she is very happy with her 5 children but that she doesn’t want to have more. She said it is difficult to provide food for such a large family. The issue is, she doesn’t understand how to prevent pregnancy. Even if she did know about birth control methods, she couldn’t afford them. The guide said more likely than not she will have more children. It was equally hard for us and the children to say goodbye. The kids pleaded for 10 more minutes of playing and the tour guide caved in a couple of times. But eventually we had to leave. The girls braided Leah’s hair while I chased the pantless baby around. 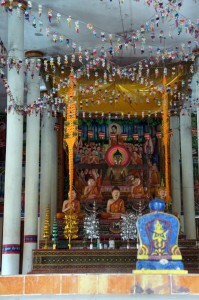 After we left the home we went to visit a Buddhist Temple. There were supposed to be child monks around but they were gone for the day =( Many parents send their children to become monks since they will be well feed and receive an education. We are told that is why there are so many monks in the part of the world. The temple was alright, very colorful. But I was mostly on a high from our day with the children so I wasn’t paying much attention. 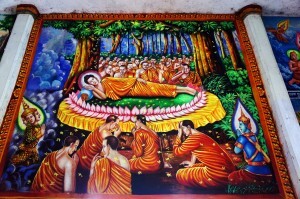 We got a picture of a colorful wall painting inside the temple. Next to the temple was a school. Boys played soccer in a field next to the school and girls talked. Their teacher did not show up so they had nothing better to do. 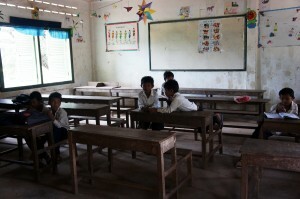 It was a sad sight going into the school room and seeing children waiting to learn. Teachers in rural schools are paid only $60 a month, which they can’t live off of. So they need to supplement their income with other jobs, often leaving the children without a teacher. It’s a hard cycle to escape, there is little opportunity for the children in this community. The tour helps a lot by bringing money and awareness. 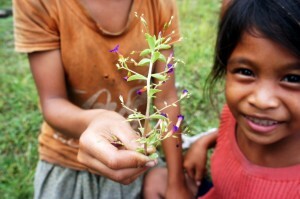 The children were happy, and they played very well together but their life is difficult. If teachers do not show up for class, it will be hard for any of these children to escape. picasaView plugin: Could not load data from picasaweb. Maybe the user or specified album does not exist? Wow what an experience you guys had there. How much did the tour cost?? Just given me an idea for back in the Philippines!!!!!!!! The tour was $32 USD each. I think a maximum of 4 or 5 can go with the tour, but we were the only ones in the group. thanks for sharing your experience! I have also done the “day in the life” tour and even though it was hot, sweaty and muddy, it was the most amazing day I’ve had in Cambodia thus far. 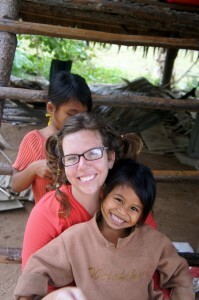 reading your blog helped me to relive my day in the village, and I thank you for that.